At UNIMAC we have simplified engineering for better quality and affordable prices, which has resulted in tremendous demand of the Unimac valves in the domestic and international market. Our products are passed through stringent quality parameters required by international standards like API , ANSI ,BS ,IS ,DIN STANDARDS. 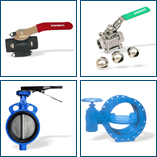 We also manufacture special valves as per customers' Design and Requirements.